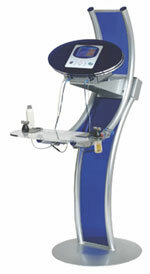 Eporex™, no-needle mesotherapy, has been available in the UK since 2004. The idea behind mesotherapy is that you can get active ingredients, such as enzymes, vitamins, minerals, plant extracts, growth factors, hormones, in small quantities, to the site requiring treatment by directly injecting them there. No-needle options such as Eporex™ seek to achieve the same aim as injection mesotherapy, but look at ways to encourage the penetration of active ingredients, when applied topically to the skin, through the protective barrier layers of the skin’s surface using mild electrical currents to assist the transportation of the substance between the skin cells. This pain-free option is therefore said to provide a viable mesotherapy alternative for needle phobics. Treatments are said to feel like a ‘pins and needles’ sensation, but are generally described as not uncomfortable. Eporex™ uses a process of electrical transdermal delivery called isophoresis. It uses a pulsed low frequency current, whose intensity is adjusted by the operator, and delivers a particular waveform which ionises the molecules in the active ingredients used in the treatments, and creates small channels in the skin for the ingredients to travel down. The head of the device is similarly charged to the ionised molecules and as it moves across the skin it repels the molecules deep into it. Ingredients contained in water soluble molecules permeate the skin’s natural lipid barrier and then cascade through the tissue beneath via minute channels created between the cells known as aquaporines, created by the Eporex™ waveform current. Eporex™ claims to be able to penetrate the skin up to 9 -10cms and be able to introduce 90% of the active ingredients being administered. The treatments use a variety of substances derived from herb and vegetable extracts, as well as human growth hormones. Many of the ingredients exist naturally in the human body so the Eporex™ treatment is designed to provide a top-up to increase the body’s ability to burn fat or regenerate tissue. A range of at-home cosmeceuticals is also often offered as an adjunct to treatment. Treatments can be performed by trained non-medical therapists. The manufacturers state that Eporex™ is able to offer twelve different treatments for the face and body using a variety of adjunctive ingredients and serums, including targeted fat, cellulite and stretch mark reduction, breast firming, treatment for stress related hair loss (alopecia), skin toning and tired eye treatment for dark circles, plus facials for preventative anti-ageing (under 30s), rejuvenating with hyaluronic acid (over 30s), acne stop for mild to moderate acne and mesolift for facial expression lines. They also state that Eporex™ can be used to treat a variety of soft tissue injuries and pain syndromes although as Eporex is not a medical device, it cannot be marketed for such treatments. A course of 7 treatment sessions are recommended for best results. These sessions are carried out once a week, and are likely to last about half an hour each. For fat reduction, often an eating plan, designed to reduce carbohydrates and advice on exercise will also be provided for in between sessions. Maintenance or top-up sessions will then be required, likely on a monthly basis. The manufacturers claim that there are virtually no risks or side effects for healthy candidates and that no serious adverse effects have been reported to date. However, there is the possibility of allergic reaction to one of the ingredients used which would become apparent immediately on application by the appearance of redness. Any likely candidate with a history of allergies is therefore advised to take a patch test before treatment. Due to the electrical output of the Eporex™ device, treatment is not suitable for pregnant women or those people with epilepsy, pacemakers or any serious psychological or medical condition. Private costs for Eporex™ treatment depends on the size of the area(s) being treated. A programme of treatments will cost between £350 - £800, depending on the area to be treated. Female abdomen before Eporex™ treatment. After 7 sessions of Eporex™ no-needle mesotherapy for targeted fat reduction. 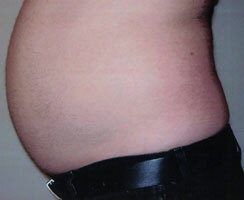 Male abdomen before Eporex™ treatment. After 6 sessions of Eporex™ no-needle mesotherapy for targeted fat reduction. Female abdomen with stretch marks, before and after 7 sessions of Eporex™ no-needle mesotherapy. Click for ALL Eporex™ clinics in the UK & Ireland registered and verified by Consulting Room.